Sharp 85in 8K TV to go on sale in Japan | What Hi-Fi? With sales of 4K TVs just starting to gather momentum, research company IHS Inc predicts that one in five new TVs sold in 2016 will be 4K. 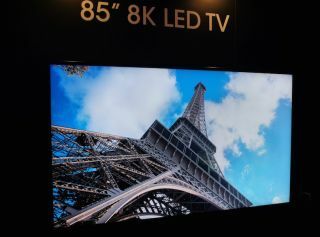 But that hasn’t stopped Sharp from releasing an 8K screen to the market from the end of October. Called the LV-85001, the 85in screen is actually a monitor with a tuner built-in, and has a resolution of 7680 x 4320, or 16 times the resolution of Full 1080p HD. The tuner isn’t yet capable of receiving 8K signals, but considering there aren’t any 8K broadcasts at the moment that is no deal breaker. However, the Japan Broadcasting Corporation NHK has been trialling 8K TV broadcast signals in Japan, with a planned rollout in time for the Tokyo Olympic Games in 2020. If you do manage to get your hands on some 8K footage, such as this video on YouTube, you’ll need to plug into all four HDMI inputs to provide enough bandwidth. The LCD panel uses Sharp’s IGZO technology, which is claimed to deliver twice the resolution of regular LCD panels. To get your hands on one, contact Sharp’s business-to-business sales team and be prepared to stump up the $133,000 asking price when it goes on sale on 30th October. Alternatively, you could take a look at our round-up of the best 4K TVs (unfortunately they go up to only 65in in size) on the market right now, and be safe in the knowledge that Ultra HD Blu-ray discs will be in stores by Christmas.